EOS is a blockchain technology that is unique amongst its peers. More than just currency to be traded or a slow pondering network to move funds, EOS is a truly a powerful commodity that enables the future of decentralisation and global change. This power brings a host of features that haven’t been seen on other blockchains. This requires more than just a wallet to hold and transfer funds. EOS is the fuel that drives distributed proof of stake and the block producer election through the community’s votes. EOS is the fuel that grants Dapps their fair share of the decentralised computing power so people can interact with the blockchain for free. EOS is the fuel that will drive change in the world. While this complexity may seem overwhelming to some, we are working hard to make these features as simple and intuitive to use as possible, and provide access to these features as early as possible. We want to make sure you don’t need to be a developer and network administrator to leverage your stake in the EOS network and community. eostoolkit.io is a web based application that integrates exclusively with Scatter to provide secure key signing. We exclusively use https for all connections to the EOS network, and we provide all Governance documents and Ricardian contracts to ensure compliance with the EOS Governance. Please take the time to review the parameters of all EOS transactions in Scatter prior to approving, and become familiar with what parameters some transactions require, and which may be suspicious. We will never ask for a private key. Never provide your private keys directly to online applications. Our code, and that of Scatter’s is fully open source. We encourage you to take a look at our Github project to review the code, get development ideas, verify that we meet your own personal security desires, or even contribute! Part of our goals is not only to make EOS easy to use, but show that EOS is easy and powerful to develop on and interact with. As the EOS community matures countless tools and Dapps will be released and made available over time. We would like to remind everyone to exercise due diligence and caution when interacting with these exciting new applications. Part of this due diligence process is ensuring that trusted block producers have reviewed and endorsed these applications. 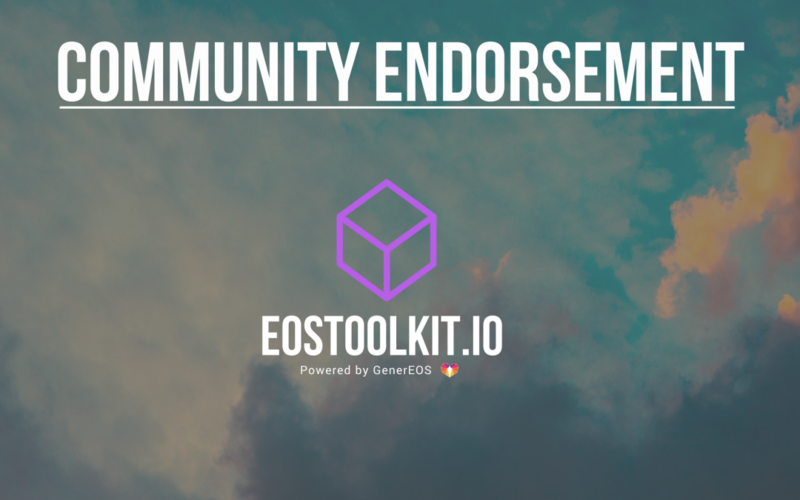 To provide peace of mind when using the eostoolkit.io we have actively worked with several block producers to give them an opportunity to review and run our code and provide their personal endorsements.